The foreigner Padma Shri Gausevak who tends to cows in India! Padma Awards – one of the highest civilian Awards of the country, are conferred in three categories, namely, Padma Vibhushan, Padma Bhushan and Padma Shri. The Awards are given in various disciplines/ fields of activities, viz.- art, social work, public affairs, science and engineering, trade and industry, medicine, literature and education, sports, civil service, etc. Padma Vibhushan is awarded for exceptional and distinguished service; Padma Bhushan for distinguished service of high order and Padma Shri for distinguished service in any field. The awards are announced on the occasion of Republic Day every year. 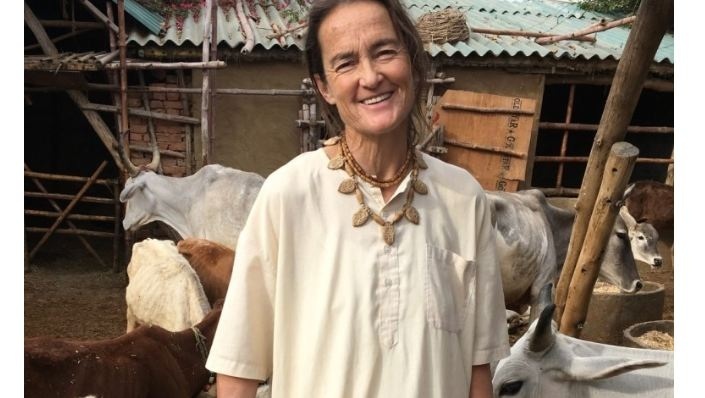 Friederike Irina, who is originally from Germany, has also been given Padma Shri yesterday by the Narendra Modi government to honor her for exceptional work in the animal welfare. Understood who we are talking about? You perhaps know as the Sudevi Dasi of the Radha Surabhi Goshala who she founded in 1996. Padma Shri Friederike Irina or Sudevi Dasi made India her home and stays in Radha Kund, Mathura for over 35 years, taking care of cows in need. Today she is a local celebrity and considered a mother figure for her exceptional service towards the holy cows. Sudevi Dasi, the ace Gausevak’s Radha Surabhi Goshala provides the home to the homeless and abandoned cows. It provides food for no less than 1200 cows every day and also provides medical aid for the sick, handicapped, and the injured cows. Radha Surabhi Goshala is situated in the Radha Kund, Mathura, Uttar Pradesh. Cows occupy a pride of place in Hinduism, Jainism, and Buddhism and are considered a divine blessing of the God and beef is a taboo. With a monthly expenditure of Rs.20 lakh and the abandoned and sick cows increasing, this initiative by Sudevi Dasi is like an oasis in a blazing desert for the cows and also the animal lovers. The Padma Shri honor for Sudevi Dasi is likely to inspire more to take to animal welfare. Germany: With cow’s blessings, another Hindu Temple is soon coming up!